In 2007, Time magazine named him one of the most influential novelists in the world. He has twice been short-listed for the Man Booker Prize. 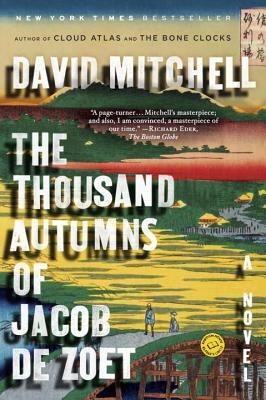 The New York Times Book Review called him simply “a genius.” Now David Mitchell lends fresh credence to The Guardian’s claim that “each of his books seems entirely different from that which preceded it.” The Thousand Autumns of Jacob de Zoet is a stunning departure for this brilliant, restless, and wildly ambitious author, a giant leap forward by even his own high standards. A bold and epic novel of a rarely visited point in history, it is a work as exquisitely rendered as it is irresistibly readable. The year is 1799, the place Dejima in Nagasaki Harbor, the “high-walled, fan-shaped artificial island” that is the Japanese Empire’s single port and sole window onto the world, designed to keep the West at bay; the farthest outpost of the war-ravaged Dutch East Indies Company; and a de facto prison for the dozen foreigners permitted to live and work there. To this place of devious merchants, deceitful interpreters, costly courtesans, earthquakes, and typhoons comes Jacob de Zoet, a devout and resourceful young clerk who has five years in the East to earn a fortune of sufficient size to win the hand of his wealthy fiancée back in Holland. A magnificent mix of luminous writing, prodigious research, and heedless imagination, The Thousand Autumns of Jacob de Zoet is the most impressive achievement of its eminent author.